It’s been a long time since I played a game which throws me back in time. Back to when I booted up my first PC and played ‘Chips Challenge’ or ‘Secret Agent 3’. I love old school adventure games. They didn’t rely on massive storylines or ground breaking graphics, they were simple, easy to follow and very enjoyable. I though those days were over until I stumbled on Brawsome’s ‘MacGuffin’s Curse’. Brawsome are an independent game developer from Melbourne, Australia. They are well known for their point and click adventure game ‘Jolly Rover’, which won “Best Australian Game” at the Freeplay Awards. In MacGuffin's Curse, You take the role of Lucas McGuffin, a thief, who is sent to steal an amulet from the local museum. All seems well, until you put on the amulet and gain the ability to shape shift into a werewolf. Using your new found strength you need to find a way of removing the cursed artefact and convincing the city that the most love citizen is an evil master mind. 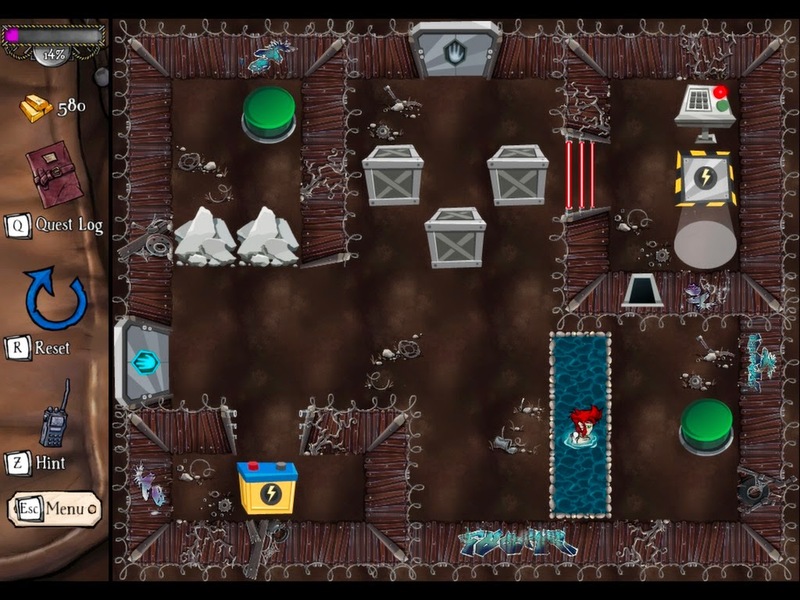 The game is setup as a room to room puzzler where the player has to power a door by pushing a giant battery onto the control pad, with the added element of having to change between human and werewolf. The levels start off pretty simple, but as the game progresses they get more and more challenging. They are very clever, beautifully structured and really make you think 3 moves in advance. With over 150+ puzzles and 90+ side quests you know you’re going to be in for a long game. The good thing is you can play the game in short bursts or settle in for a long haul without worrying about getting lost or going over the same puzzles again and again. I thoroughly enjoyed playing this game and found myself wanting to complete all the side quests and collect the bonus ‘Comic Pieces’, that expand on the storyline. One thing that really stood out for me was the soundtrack. I normally get annoyed with puzzle games when the music is repeating over and over, but this was different, I found the music really set the scene and was a solid feature. I would have liked to see some voice overs in the game to bring the characters alive, but that’s only me being critical. MacGuffin’s Curse is a fun and humorous game that has an easy to follow storyline and I look forward to seeing what Brawsome comes out with next.